Officially accepted as dead: 8th May 1915; age 25; KiA. Date of Entry Therein: 16th January 1915 – France. 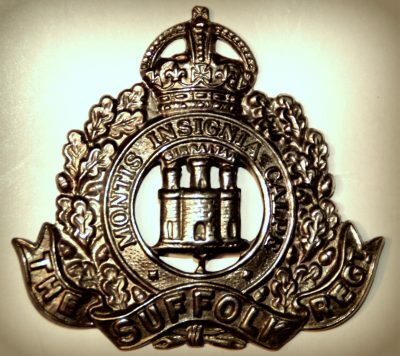 Regiment: Suffolk Regiment, ‘A’ Coy, 1st Battalion. Relatives Notified & Address: Son of Thomas & Frances Caroline Baxter, of 42, Bell Lane, Ipswich. 1901 42, Bell Lane, Ipswich. Albert was 10 years old and living with his parents & brother. Thomas Baxter, 53, a Machinist at Factory, born Linstead, Suffolk. Francis Caroline Baxter (nee Stringer), 48, born Diss, Norfolk. William Baxter, 16, a Labourer at Foundry, born Ipswich. 1911 42, Bell Lane, Ipswich. Albert was 20 years old, a Quay Labourer. He was living with his parents & brothers. Thomas, 63, a Driller – Iron Foundry. Thomas Edward Baxter, 34, a Wood Labourer, born Diss. Frederick Baxter, 28, a Quay Labourer, born Ipswich. Albert attended Stoke School, Ipswich. Albert is also remembered on the war memorial at St. Peter’s Church, Ipswich.